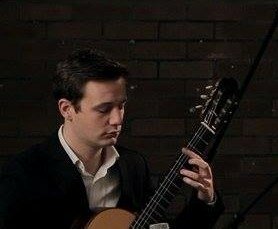 I am a classical guitarist studying for a post-graduate degree in performance at the Royal Northern College of Music, Manchester where I was the recipient of the Ian Spencer-Fox Bursary for Guitar. My time in higher and further education has provided me with a wealth of performing experience. As a soloist I have performed in concerts both in the institutions themselves and in the surrounding area. These include a student showcase concert at the University of Hull, a lunchtime concert at the RNCM and an evening of Spanish Renaissance guitar music at the Cervantes Institute in Manchester. I have also been a member of a variety of ensembles including guitar orchestras, choirs and early music groups. I am part of regular violin/flute duos with whom I have performed with at a variety of concerts and events. As an undergraduate I also was also part of orchestras in University Productions of Broadway Musicals and Baroque Operas, the latter of which I played theorbo for in the continuo section. Over the past few years I have helped to usher in live music at Haddon Hall, Derbyshire where I have created and helped to organise recital programs to include groups of musicians performing alongside myself. I have also studied Lute and Alexander technique with Lutenist Jacob Heringman in York and have studied Music Performance Psychology at both undergraduate and postgraduate level with a particular focus on performance anxiety and memorization. I recently volunteered at the European Society for the Cognitive Sciences of Music Conference 2015 in Manchester where I attended lectures by leading music psychologists and discussed my specific areas of interest with them. I have always maintained private students from a variety of ages/abilities either on a regular basis or when requested and; have also covered for absent teachers at the Ramsbottom Music Centre. I teach a variety of repertoire depending on the students needs, whether for examinations or for improving their technique; or simply music that they enjoy. This has ranged from ABRSM examination repertoire to pop song arrangements. As a student I found taking part in performance classes essential when preparing for a recital. It also gave me the confidence and experience to provide constructive criticism for my fellow peers in a helpful and friendly manner. In addition, observing the teaching techniques of lecturers during a class/lesson is something I have taken note of and intend to apply myself when teaching. During the past year I have worked as volunteer for LIME Music for Health at the Royal Manchester Children’s Hospital. This involved playing to children on the wards as part of a small musical ensemble, encouraging the patients to sing and get involved using percussive instruments. I submitted a dissertation entitled, ‘Technical Analysis of Leo Brouwer’s Étude Simples 6 – 10’ in partial fulfilment of my undergraduate degree. Using methodology consisting primarily of Classical guitar technique manuals, I created a series of practical exercises to overcome the technical issues in the pieces. My research increased my knowledge of guitar technique with added pedagogical value in relation to the études. I have been fortunate enough to receive excellent tuition in classical guitar from some inspirational teachers. Along with my passion for the instrument and its repertoire, these experiences have motivated me to strive for a successful career as a pedagogical teacher. I want to provide students with the same enthusiasm and skills that I have received so that they themselves can become equipped to pursue their own aspirations as musicians. I do my utmost to prepare a careful lesson plan having assessed the students capabilities and discussing with them how they might like to move forward. I also like to provide notes at the end of lessons to summarize what we have learnt that lesson and to give the student an idea of what to practice in their own time if need be. When teaching younger students I always aim to have a good line of communication with their parents/guardians. Updating them with their child's progress to make sure that they are happy with everything.